Discussion in 'Software' started by thatcomicsguy, Nov 21, 2014. Still not in English yet, but it's looking cool. Sai is made by one guy, if I understand things correctly. I find it remarkable that one person can make such a beautiful piece of software. He tells us that when V2 is out of beta, he'll do something about translating it. It's cool right now to be able to take full advantage of 64bit systems; huge canvases and full memory usage and all that good stuff. Sai has perhaps my favorite brush action out of any art software. Miles better than Photoshop, and I don't know what it is exactly, but the stylus and brush response feels nicer even than Clip/Mangastudio 5. Maybe that's just subjective, but I really like the smooth feel of this drawing program. Art_N00b and Druid like this. I hope this comes out soon. -He's the only developer who takes feature request emails. (Though he still hasn't included mine; freehand/polygonal selection toggle with a keyboard button, like in Photoshop). I will read all emails of features request but I will not be able to reply to all request emails because I am one man team for development and customer support. Thank you for your understanding. The handling of the pressure curve is quite an improvement over SAI1 for me; cross-hatch is now much more regular. Also, I like the newer brush controls except for the blending controls which I still have to master. Free trial works fine, but the purchased product requires you to complete the installation on your own; the product does not self-install lke every other software I have ever downloaded. > > > > - Let us know the path of your SAI's program folder. > > > > > > > > - Let us know "Link Target" of the shortcut of "PaintTool SAI Ver.1" on Desktop. > > > > > > > > 1. Right click "PaintTool SAI Ver.1". > > > > 2. Click "Property" on context menu. > > > > 3. See "Link Target". > > > > > > > > - Let us know the current system ID of your PC. I followed the instructions, but my PC did not have the "Link Target" option, so the install never worked, and I was not given a refund. This sounds really annoying. Easy installation ought to be a priority with consumer grade software! Japanese software makers take pirate paranoia to a whole 'nuther level compared to everybody else, making it quite difficult to get your legit software working. I've been through it with SAI, ClipStudioPaint and OpenCanvas. Each have weird systems to prevent their stuff getting stolen. Maybe if you copy/paste that info to them, they'll be able to provide the next step? sonichedgehog360 and WillAdams like this. It just came out a few weeks ago, on December 27, 2017. You can download the beta technical review here and use it freely. -If you have a license, (which happily, I do), then you can use in an unlimited capacity. It is has come a long way since I last looked at it, and while it still needs a few more added elements before it might be considered a full package, it stands quite close now to being ready for prime time release, or so I'd estimate. I've noticed that on my Samsung/Wacom EMR digitizer, there is a tiny bit of jitter that I hadn't seen before but probably should have. I'd just assumed it was due to my imperfect hand steadiness, but if you fix the pen in one spot, you can see that it is definitely there. That is, when I hold the stylus perfectly still, the cursor will jitter around every second or so by about one pixel's worth of distance from the central point beneath the pen nib. It's a very minor effect and I honestly hadn't noticed it until now, not directly anyway, but rather when I was doing super-tight detail work in CSP where I put it down to something weird in the driver. It's not the driver. It's hardware. Not cool! This is not supposed to be happening with the Great and Powerful Wacom EMR system. But there it is. It can be observed on all levels of the OS. The Windows Ink driver doesn't work to correct this micro-jitter, which is why I was unable to draw a reliably clean line when working in very tight areas. WinTab, however, does correct for it, disregarding micro-changes in the X,Y coordinates and maintaining a stable cursor. -Which is great, as it allows for super clean line work in tight areas. However, as I have mentioned in other posts, WinTab and CSP don't play well together; at large sizes and fast brush strokes, CSP exhibits an annoying delay, which results in 'dents' when drawing long curved lines. Windows Ink doesn't do this, but does jitter at the micro-level. 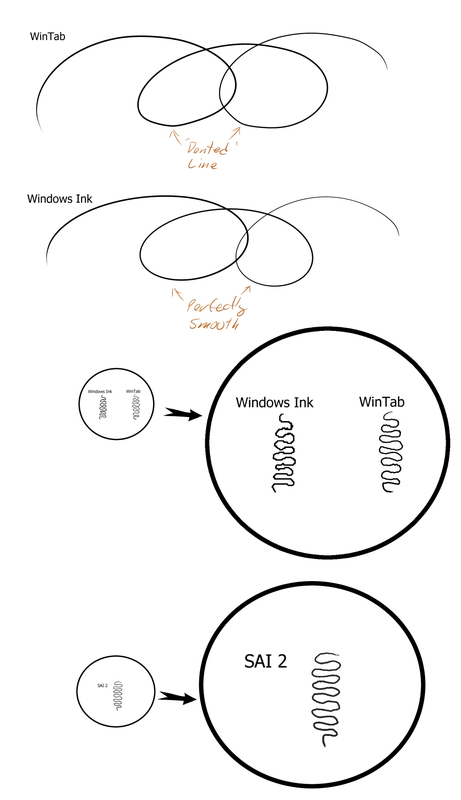 Between WinTab and Windows Ink, you can get a properly working stylus, but it means switching between the two depending on your needs. That's what we call in the art biz, "Annoying." But Paint Tool SAI works flawlessly with the WinTab driver! -On both ends of the scale. That's awesome! On the down side.., SAI isn't fully integrated yet with finger touch. It understands the pinch-to-zoom idea, but not rotate and not even scrolling. If you drag your finger across the canvas, it registers as a line input. So that's definitely an area which could use some improvement. SAI is also still locked to a full colour paradigm. There is no such thing as a black & white canvas; your file is full colour or nothing. SAI's author, Koji Komatsu, informed his users long ago that he had chosen this because of certain inherent efficiency benefits. -And, boy, you could sure see them! No other software at the time was even close to being as smooth and responsive as SAI. But times have changed. -Both in terms of CPU powers available to users which make such efficiencies less critical, but also for guys like me, where RAM limits are no longer a real concern. -I am now working on a system with 16Gb of memory! That's huge compared to when I was first trying to get work done with SAI on only 2Gb of ram. So the full-colour only thing isn't really a problem in either sense, -though having the ability to work on black & white canvases would cut out a few steps for me in post production. SAI can save in it's own native format, or in a variety of others, including fully layered Photoshop .psd documents. (Though, you lose any specific text or vector file information in the process; it's all converted to raster upon saving.) But it can't open or create .tif documents. For me that's a pain, since .tif is my default on everything. I picked it exactly because it seemed to be a standard across all art software, so I didn't have to worry about formats falling out of vogue over the years. (I have run into ridiculous challenges, for instance, trying to open old project layouts created back when I was using QuarkXpress and Adobe PageMaker before that). So I have thousands of .tif files today and I absolutely want to keep on using them. SAI needs to get that format adopted before I'd give it my full endorsement, for sure! But one of the things I really like about SAI is Koji's particular style of GUI design thinking. It's elegant, minimalist and works really well. -For instance, when using the gradient feature to fill a selected area, SAI instantly creates a real-time preview of what the area will look like. You can drag around the cursor and when the gradations look right, you just release and there it is. This is such an obvious and useful refinement, it amazes me that nobody has thought of it before. SAI is full of little items like that. There are still areas which need refinement; SAI 2 is still a beta model, but unlike last year, it now resides at a point where I think I can actually use it as a serious production tool. I'm going to try using it for my next bit of work! Art_N00b and cspaint like this. SAI 2 doesn't deliver 100% perfection, but in the digital world it's certainly getting close. -That is, it's hard to tell where my own hand control is to blame versus jitter. These were tiny, slow lines, and I'd expect about the same results on paper with a roller pen. Art_N00b, cspaint and WillAdams like this.